IBEW Local 37 is supplying employers with the qualified, dependable lineworkers they need to meet the demands of project work occurring in New Brunswick. The jobs come with an attractive wage and benefit package as well as the protection of a collective agreement that covers working conditions, including overtime provisions. 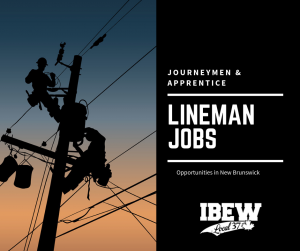 The total wage and benefit package for a certified lineman in New Brunswick from union employers is currently $41.80/hr + 10% for vacation and statutory holidays + $7.80/hr for benefits = $53.78/hr + room and board if required – variable rates for apprentice lineworkers, as per the industry standard. IBEW Local 37 is working with employers such as Emera Utility Services, K&M Utility Lines, PowerTel, and others. If you’re a qualified New Brunswick lineman and would like more information, please complete the form below. You may also contact IBEW Local 37 directly by email (info@ibew37.com) or phone (1-877-467-0037. Are you, or have you ever been, a member of IBEW?